How does meditation and gratitude practice help cure cancer? How to recognize adversity as a gift from the Universe to put you on your rightful path helping others with what you have overcome? How to bootstrap a successful business that is in perfect alignment with your calling and true talents as individuals and as a couple? Learn today how to come through adversity to build a stronger bond of love and bootstrap a successful business. Often the best businesses are borne from adversity. We are called on in those moments to find new paths and new ways of thinking to tackle the challenge, the trauma, the change … and when we do, often a calling comes with it to help others applying what you have learned. For couplepreneur Tamara Green and David Dachinger it was a terrifying diagnosis of Stage Four cancer. 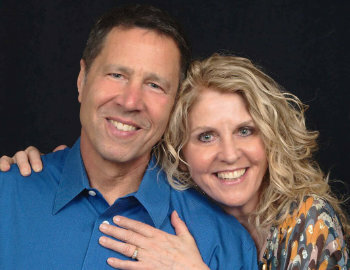 Today we talk about how the disease brought them closer together as a couple – and how it sparked a fast-growing business when they combined their diverse talents and expertise to helping cancer patients with meditation. Loving Meditations is an app now regularly listened to in 35 countries, and it is having transformational outcomes in helping to heal thousands of people. When David was diagnosed with Stage 4 cancer, the Grammy Award nominee composer had already been recording meditations with his wife Tamara Green, a couple’s psychotherapist, hypnotherapist, and meditation facilitator. Described by Elle Magazine as the “Soul Centered Love and Relationship Expert”, Tamara applied her expertise to healing her husband, who was also enduring chemotherapy, radiation therapy and surgery. Why your true calling in business may be simply sharing how you yourself overcame adversity alone or together as a couple. David is also featured in Cancer: From Tears to Triumph, a book filled with inspiration from survivors, health care and support professionals, care-givers and loved ones. Get it here. Licensed as a Certified Social Worker and an acclaimed psychotherapist, hypnotherapist, and life coach in private practice, Tamara was called “The Soul-Centered Love & Relationship Expert” by Elle Magazine. She’s often featured as a behavioral health expert on Today.com. Tamara combines her many years of professional training and life experience to create powerfully effective guided meditations that have helped thousands to achieve peace, love and wellbeing. Her educational degrees include a Bachelors of Science in Public Administration from the University of Southern California, and a Masters in Social Work from Fordham University. She attended Ackerman Institute for Couples and Family Therapy for her postgraduate training and has recently done Advanced Training with the Center for Mind-Body Medicine. David Dachinger is the cofounder of ​Loving Meditations​ and international best selling co-author of the book, ​Live Calm With Cancer (and Beyond). David is a career fire lieutenant and Grammy® nominated recording engineer who has composed inspiring music for America’s most celebrated sporting events and television shows. Over 1.5 billion people have heard his music on CBS broadcasts of the ​Super Bowl​, ​The Masters and the ​NFL​. David is a survivor of stage-4 head & neck cancer. Burned out? In overwhelm? Getting stressed trying to “do it all” to “have it all? Join other successful women entrepreneurs at this unique, immersive and intimate Retreat this May in Scottsdale AZ. We take over a luxury spa for 3 ½ days of relaxation, rejuvenation and pampering; collaboration, co-creation, and connection. You’ll leave energized, empowered and ready to step fully into the light. We’re taking applications right now. Hurry we have only 33 spaces and they are going fast! Want the practical blueprint to make your money work for you – rather than you working for your money. Every entrepreneur needs to “know their numbers”, focus on creating predictable recurring revenue and avoid the traps of entrepreneurial poverty. Join financial expert and MBA Katherine Dean for her “Wealth To Freedom” lesson so you can release any limiting beliefs, get practical tips on boosting your savings, growing a profitable business and more. Check it out at wingspodcast.com/wealth. Grab your WINGS! Learn from 60+ women entrepreneurs who’ve “been there, built that” to create and sustain 6, 7, 8, 9 and even 10 figure businesses, grow their influence and overcome many challenges along the way. We share our success habits, give practical advice you can implement right away to transform your business and your life. Free for live streaming and early bird discounts now for lifetime access, instant downloads of video and audio lessons, bonus content plus access to an exclusive private Mastermind and a private VIP invitation to join the Wings Inner Circle for mentoring and more. It’s your “entrepreneurial MBA”! Join the Inner Circle for group coaching, mentoring from Melinda Wittstock and her growing network of top performing entrepreneurs and investors, and mastermind with your “business family”. How much is your company worth? Want to find out how to boost your valuation? Click here to claim your FREE consult call with ZLV Founder Steve Little for your valuation enhancement and capital acquisition strategy. You can also book your complimentary “office hours” with Steve.